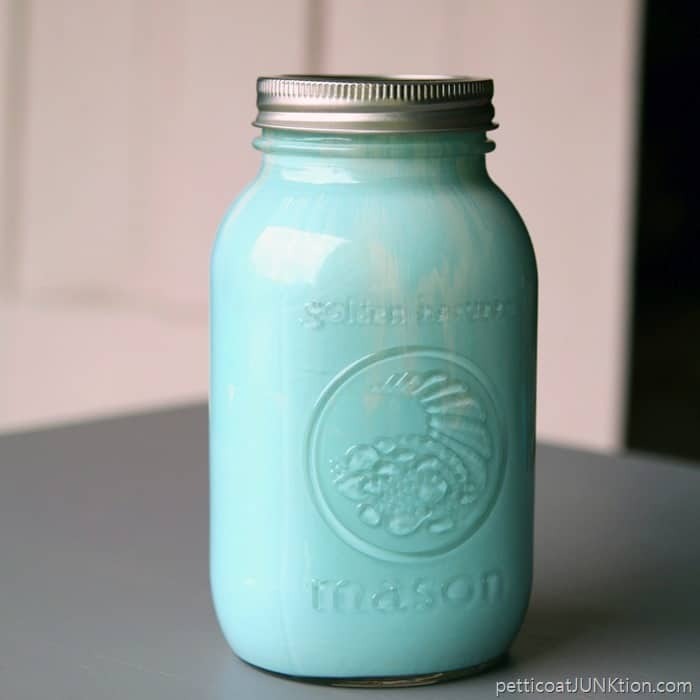 Turquoise paint and green paint go together like peanut butter and banana, or chocolate and caramel, or me and the JTS. Yep, I’m on a roll today. Get ready for a lot of photos and a complete tutorial (Kathy style). I had a plan for this piece and of course it went sideways. 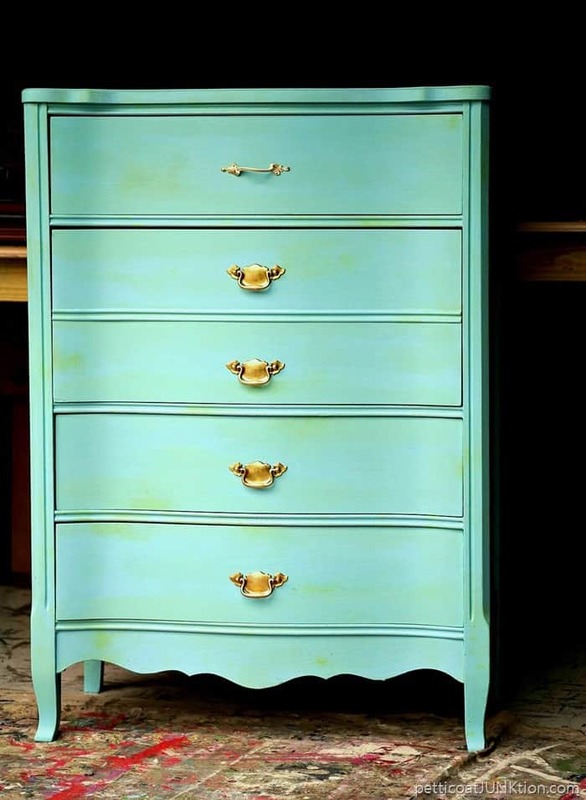 I planned on a simple turquoise paint finish and it ended up being so much more than that. The photos really don’t do justice to the paint job. I didn’t capture the variations in the paint colors as I had hoped. There are a few close up shots that give a better look at the colors. 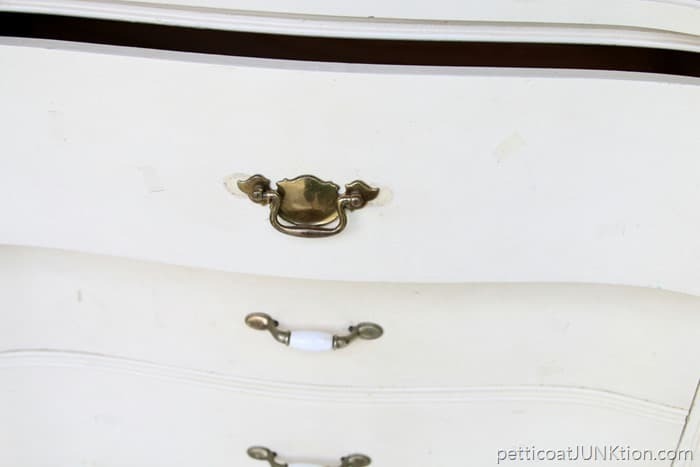 The plain white chest of drawers came from the Nashville Flea Market. The price was $40. The chest needed some work but nothing the JTS couldn’t handle. The top had come unglued on one side and the sides were pulling away from each other just a hair. A little wood glue, straps, and drying time was all it took. I sanded the rough spots in the paint by hand using 120 grit sandpaper. 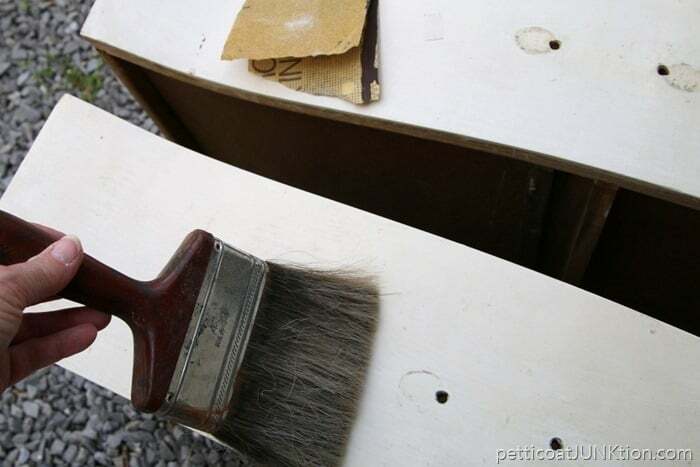 A large paint brush works great for dusting all the stuff off after sanding. Then I wipe the chest with cheesecloth to remove any remaining paint dust. 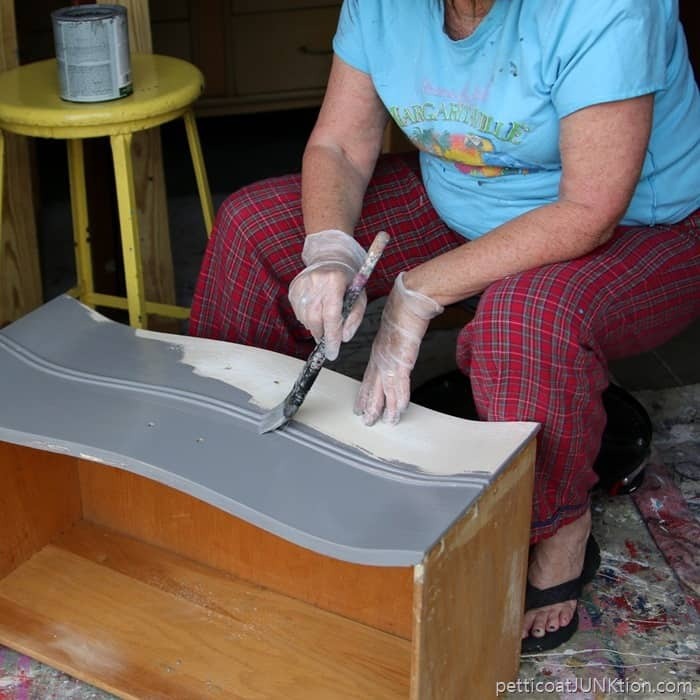 The JTS (aka, Junktion Technical Specialist, aka hubby) caught me in all my loveliness applying Glidden Gripper primer. 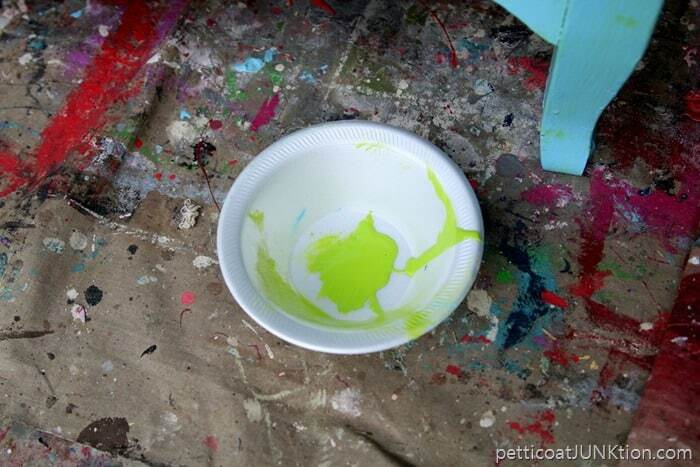 How many paint colors do you think is on that drop cloth? I’ve had it with me since long before our time in Florida, meaning before 2006. You guys will remember I’m trying to use the paint I have instead of buying more. 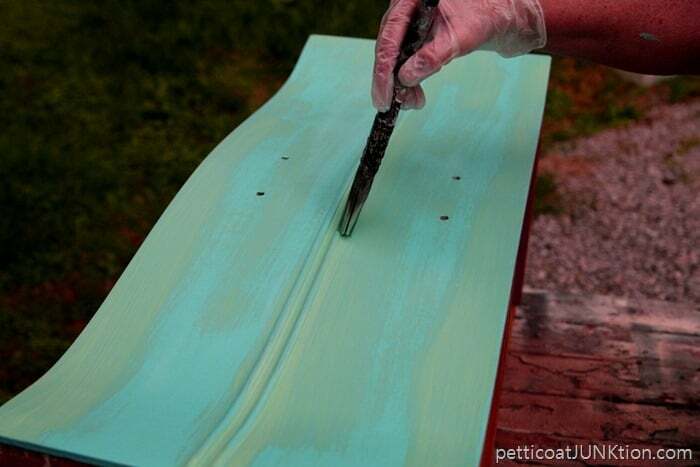 I mixed blue paint and a dab of green paint to make the turquoise paint. Then I added white paint to lighten the color. I usually mix paints in plastic containers but I like this ideas so much better. I can see the pretty paint. I’ve read that it’s not good to mix paint sheens that aren’t close to each other…like you can mix flat and eggshell, but not flat and semi-gloss. I ignore that and mix together what I have. 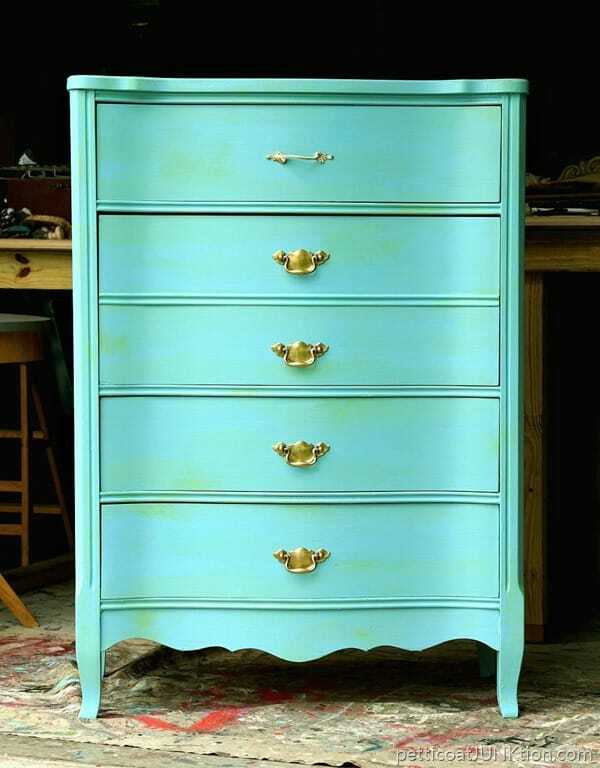 After I painted the chest with the special mix turquoise I looked at it and knew I needed to do something else. It wasn’t making enough of a statement for me. I mixed more green paint with a bit of the blue paint then added water to make a wash.
Then I just brushed the wash on in areas, not all over. That still didn’t do the trick for me. I went with the straight up green paint. I dabbed a bit of the green paint here and there on the chest. Finally happy with the paint job and moving on to the furniture pulls. I didn’t like the pulls on the chest at all and they weren’t original to the piece. I searched through my crates of furniture hardware and came up with four large brass pulls. 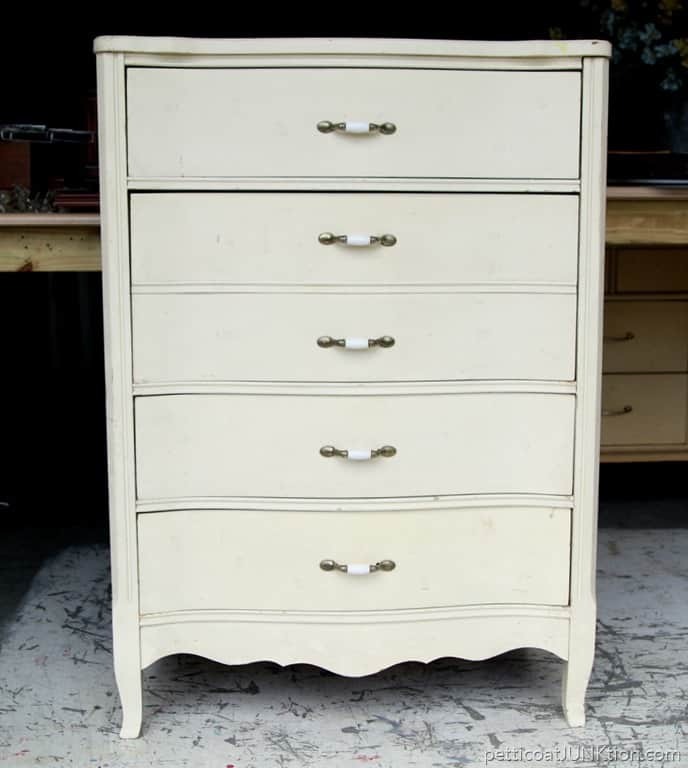 I then found one small French Provincial type pull that would do for the top drawer. I wanted pulls that would fit the original screw holes so I didn’t have to drill new ones and fill the old ones. A giant pain. Now that I’ve found Bar Keepers Friend I can’t get enough of it. 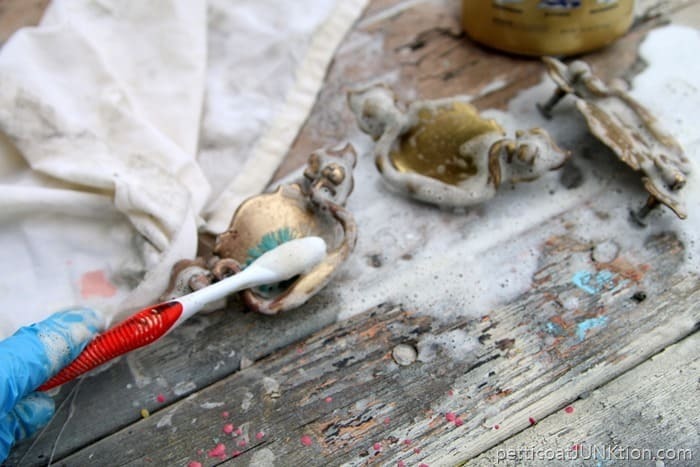 It does take a little elbow grease to get the tarnish off the pulls but it’s worth it. Just look at the difference in the two pulls. Amazing. And that ‘s it. I’m patting myself on the back and having a piece of chocolate. In this photo you can see more of the green wash and where I dabbed on the green paint. 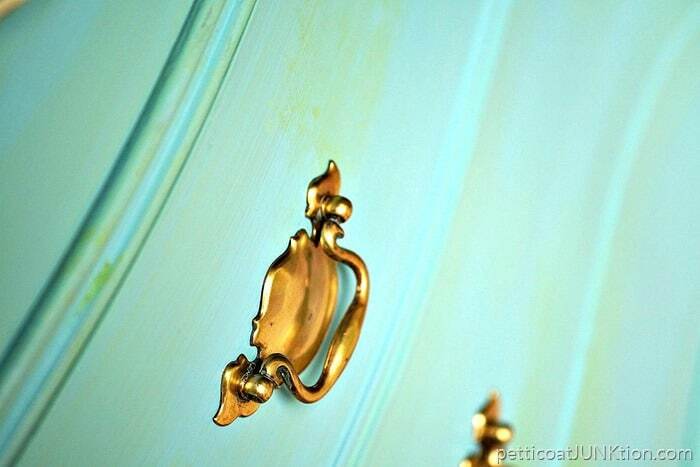 And the shiny brass hardware looks so pretty against the turquoise paint color. I will be sticking with the original hardware on furniture now that I know how to clean it. Do you guys like the turquoise and green? 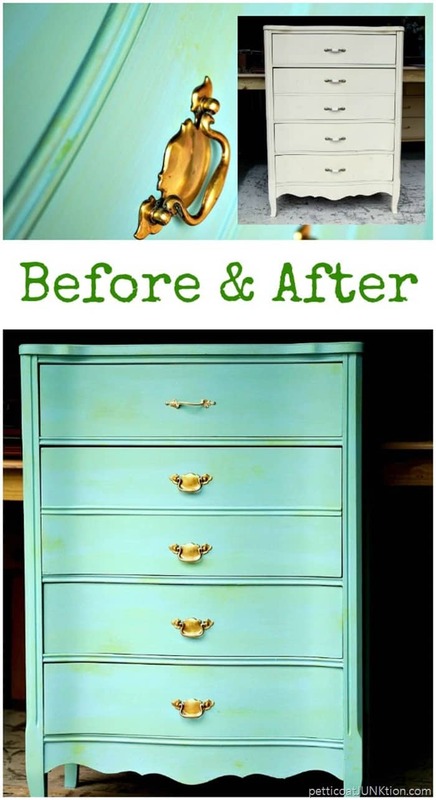 I wanted to do something a little different for this furniture makeover. I think some of my projects have been a little ho hum lately so time to step up my game. Leave a comment for me below and have a fantastic day! Wonderful color mixology and layer blending Kathy, I adore this combo reminds me of the Caribbean sea, just beautiful! Thanks for sharing it at Fridays Furniture Fix. I love the look of layering colors. 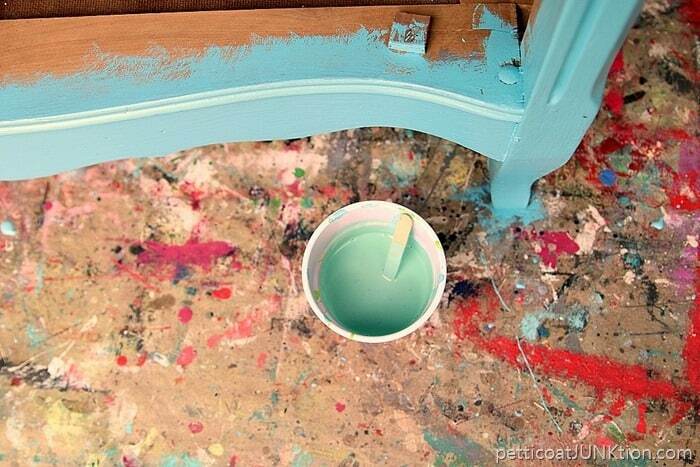 This looks wonderful, but I have always liked turquoise and green plus lavender together. It looks beautiful. 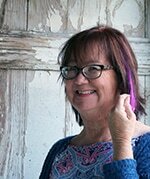 Hi, Kathy, Thanks for writing on an awesome idea. It would be delighted the room. Nice color choice and the hardware really warms it up. Lovely! Fav colors for me. And mixing pulls? Never thought of that before. Love the colors, love the idea of mixing all your leftover paints to get the color you want and I do like the different pulls. But I really LOVE your red plaid pants – I have some just like them! Another inspiring transformation! Makes me long for the warmer weather to get painting! The color is phenomenal! I love the hardware you chose as well. Kathy, I jjust love this color combination…. 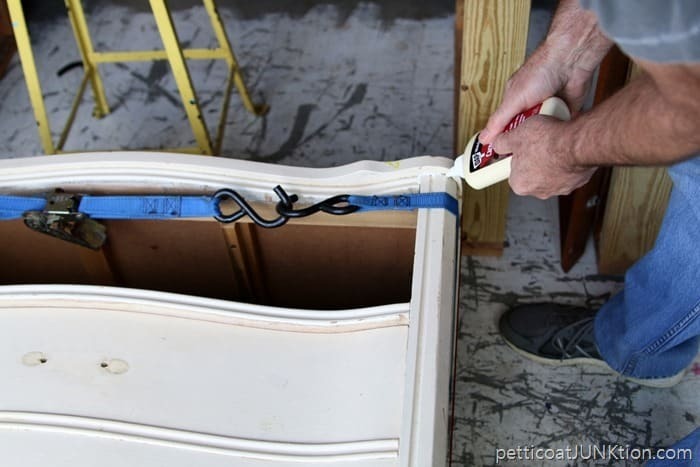 I love the mix matched pulls…… I probably would have put a different one on each drawer…. You do fabulous creations………… Love all your ideas…….. Does this dresser ever bring back memories! Ages ago when I was a new bride, I enjoyed browsing through a gorgeous consignment shop. I was taken by a hand-made, hand-painted jewelry box in those same colors! I wanted that little box soooo much, but it was beyond my budget. I hope that whoever purchased it would really love and enjoy it. Fabulous, gorgeous, fanstatic. You did an excellent job here. I love it that you ignore instructions on mixing paint sheens !!! I love the color & the bright brass, but I don’t like the mismatched pull. 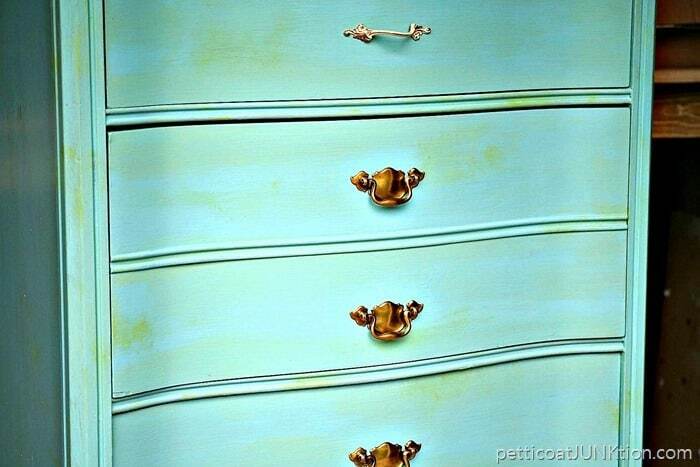 If you had filed the holes & added a brass knob to the top drawer it would look planned. As it is, it looks like you didn’t have enough pulls & put any old thing on there—which is pretty much what happened. I do enjoy your blog. You have a small budget & you routinely make something out of nothing. My favorite is your red radio cabinet. (isn’t it everyone’s?) I love color & I’m baffled when a great colorful piece doesn’t sell. If I lived close by I’d be buying those colorful ones so you wouldn’t have to repaint them white. You’re lucky to have affordable places to shop. I live in southern California, where thrift store prices would be outside your budget. 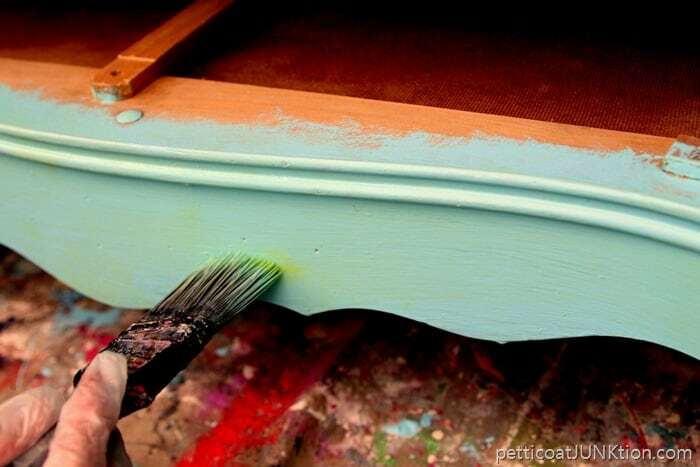 Our buying prices for fixer-upper furniture are close to your selling prices when the makeover’s done. I like what you did on this dresser. The color adds a lot of depth and interest. 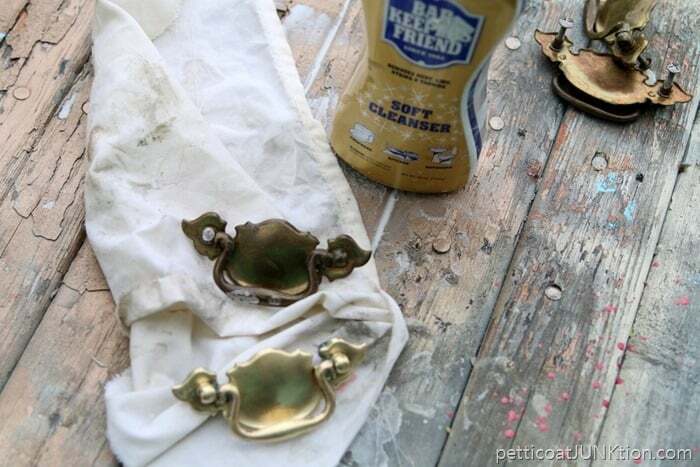 I don’t know if you spray lacquered your shiny nice brasses hardware. But, it is something to keep in mind. I got a laugh out of your husband taking your picture as you were painting because I swear I have that same outfit! 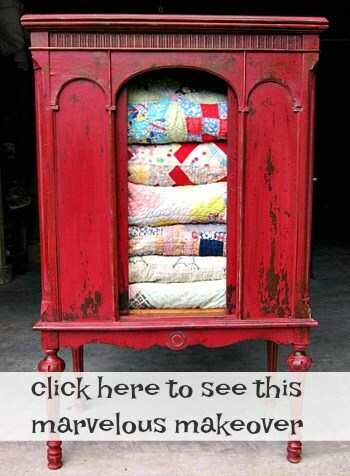 Love, love, love this dresser! You did an awesome job. Thanks for sharing. One of my favorites that you have done. It looks great! I do like it! Looks fantastic. I need to look for some of that polish. I love this!! What a fun piece! Beautiful! Love, love the colour! One of my faves! I love how you “play” with color, Kathy. The layers look fabulous along with the custom colors you mixed. I would have never had the guts to add the bright green but it looks great. This girl needs to find that Bar Keepers Friend here in Canada. The chest looks very nice, these colors do work great together on furniture, I have also used home-mixed turquoise dry brushed over olive green paint and love that look as well. I would of never thought of putting those colors together. It looks great!! Oh Kathy, this is WONDERFUL! Even with the title to this post, I still had to look for a moment at the chest of drawers to really see the green over turquoise. At first blush, it just has depth and warmth. 🙂 Love the brass pulls also! Thank you for the reminder about Glidden Gripper.